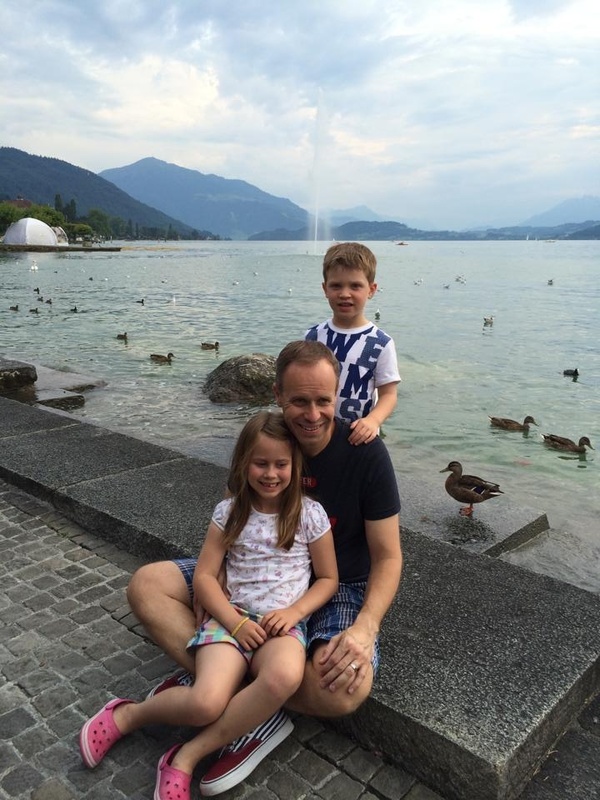 This was the first weekend in Switzerland, three days into our Big Adventure. Steve had left for Denmark early in the morning and so the week was stretching out in front of us like a game of Monopoly (you know how it goes on and on for days at a time until someone gets fed up and tips the board up by ‘accident’). So the question was what to do. On the Friday evening we had taken a trip to Zug, had a little stroll along by the lake and revelled in the view, feeling generally proud of ourselves for doing this mad thing of moving abroad. We had also found out about Boardstock which seemed to be a weekend of demonstrations and shows of anything connected to skater boi sports (BMX, skateboard, balance board, wake board – and golf). So the plan was to take a trip to Zug on the train (let’s face it, driving wasn’t going to be a good idea) to see what Boardstock was all about. Saturday morning dawned, rainy and grey. The kids were playing me up and with the week stretching lazily in front of me (with a permanent sense of fear bubbling in the pit of my stomach) I snapped and we spent the day at the apartment unpacking more boxes. So, Sunday dawned, brighter and, as none of us could face another day in the apartment we had lunch and set off to the train station. Our apartment is only a 5 minute walk to the train station and full of steely determination I faced the ticket machine. Yep, here in Switzerland there is a machine on the platform that sells the tickets, no ticket master to get bewildered by or confused with our request. What’s even better the machine can operate in 4 languages, English being one of them. So tickets bought the train arrived, bang on time (loving Swiss efficiency), quietly swishing into the station. The kids loved the fact it was a double decker, although there was some debate over going up or down and by the time they had decided and we’d sat down, it was time to get up again as we had arrived at Bahnhof Zug (that’s Zug Station, see I’m learning!). Now. Where the hell are we? We have arrived in a part of Zug I haven’t seen before. The panic, I had managed to squash is starting to inflate again. Which way should we walk to get to the Zugersee? No idea. Right, time to get a grip, the kids are starting to pick up on the panic, so I confidently start walking off to the left. Hmmmm, this doesn’t feel right. I still don’t recognise anything, Zug is not that big, I should be able to see something I recognise. Joshua is starting to ask where all the boarders are and I have no idea. I’ll pretend I haven’t heard him. Ok stop. Where are we? I then have a flash of inspiration, my phone. I have my phone. I have Google Maps. What a fantastic invention, the relief floods through me as I type in the name of the road we are stood on. Amazing and brilliant, and a total life saver, and as it turns out way more accurate than my internal compass which is decidedly off due north. Fifteen minutes later, walking in the correct direction, we arrive at the Zugersee. It is so beautiful, enclosed by mountains on all sides, being held like a delicate egg. The scene on land was anything but delicate. There were skaters, boarders, BMXers, golfers, balance boarders, then looking into the bay, high board divers, paddle boarders, yachts, pedalos, a wake boarder. Total mayhem. Joshua was in his element, Tilly a little more reserved. However the golf was “great”, the BMXers “cool”, the football trickster “awesome” (have to say, the best ball skills I’ve ever seen). The music, stalls, sports and setting all combined to give a surprisingly laid back vibe. Tilly, Joshua and I sat on the boardwalk eating ice cream and crepes, watching those messing about on the lake and revelled in knowledge that this was just the start of our Big Adventure.